Est. over 30 years we specialise in hand made, custom built, performance manifolds and exhaust systems for Race, Rally, Road Cars, Historic Race Cars, Side Car Motorcycles etc. All exhausts are "sand filled". Bent using high quality mild steel tubing in various sizes and wall thickness. 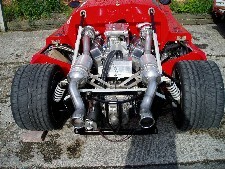 Prototype and Dyno exhausts supplied to leading engine builders. We are specialists in one-off exhaust manifolds for any application. Low quantity batches also undertaken. We also do stainless steel turbo exhaust systems.